Five Johns Hopkins graduate students, recently named to the 2014 class of Siebel Scholars, are pushing the boundaries of medical technology to develop new and improved ways to diagnose and treat cancer, heart disease and other serious health problems. The students are trying to turn stem cells into healthy blood vessels, are testing biological reactions within microscopic droplets and are using advanced imaging techniques to detect disease at an early, treatable stage. In recognition of their research skills, academic achievements and leadership qualities, the five PhD candidates are being honored as Johns Hopkins’ 2014 Siebel Scholars. The merit-based Siebel program provides $35,000 to each student for use in his or her final year of graduate studies. 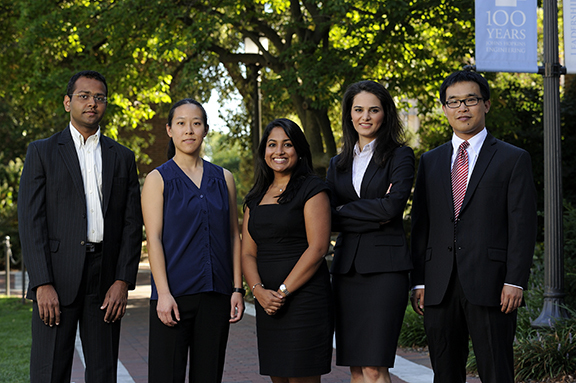 The 2014 Siebel Scholars at Johns Hopkins are, from left, Tushar Rane, Stephany Tzeng, Sravanti Kusuma, Sahar Soleimanifard and Jiefeng Xi. The Johns Hopkins recipients were among 85 students selected this year from prominent graduate schools in the United States and China, including Harvard, Princeton, MIT and Stanford. The Siebel Scholars program was founded in 2000 by the Siebel Foundation to recognize the most talented students at the world’s leading graduate schools of business, computer science and bioengineering. Today, 870 Siebel Scholars are active in the program, which seeks to nurture leadership, academic achievement and the collaborative search for solutions to the world’s most pressing problems. At Johns Hopkins, the Siebel Scholars program supports doctoral students in bioengineering studies. Four of this year’s recipients are pursuing their degrees within the university’s Department of Biomedical Engineering, which is shared by the School of Medicine and the Whiting School of Engineering. A fifth is working toward a doctorate within the Whiting School’s Department of Electrical and Computer Engineering. Sravanti Kusuma of Tucker, Ga.: Kusuma has been a key member of a Johns Hopkins team that is trying to grow healthy human blood vessels in a lab. Supervised by Sharon Gerecht, an associate professor of chemical and biomolecular engineering, Kusuma is trying to coax pluripotent stem cells, capable of becoming any type of human tissue, to turn into the kinds of cells that make up blood vessels. In addition, the team is providing biochemical cues in an effort to nudge these cells into forming networks of blood vessels. If the project succeeds, these lab-grown networks could someday be implanted in patients whose own blood vessels have been damaged by diabetes, burns and other conditions. Sahar Soleimanifard of Isfahan, Iran: Soleimanifard’s research focuses on the design, development and programming of noninvasive three-dimensional MRI techniques that can do more than merely depict the basic anatomy of blood vessels. Her techniques are also aimed at detecting the impact of stress and other factors on changes in coronary anatomy and on blood flow within the vessels. One goal is to detect early signs that coronary artery disease is present and will worsen. With this noninvasive technique, doctors can begin treatment before the condition becomes life threatening. To accomplish this complex work, Soleimanifard has been mentored by prominent Johns Hopkins engineering and medical faculty members. At the Whiting School, her doctoral advisor is Jerry L. Prince, a professor of electrical and computer engineering. From the School of Medicine, she has been advised by Robert G. Weiss, a professor of cardiology, and Matthias Stuber, a professor of radiology. Stephany Tzeng of Skillman, N.J.: In her research, Tzeng has been developing ways to deliver genes without the use of viruses that can have unhealthy side effects. Her goal is to use this genetic correction method to treat cancer and to promote tissue regeneration. Under the supervision of her doctoral adviser, Jordan J. Green, an assistant professor of biomedical engineering, Tzeng is working with biodegradable nanoparticles as delivery vehicles that can carry DNA and other genetic material to the cells. In the cells, it should help repair or replace cancer-promoting and other types of genes that are defective or missing. Tzeng is also trying to use this technique to guide stem cells to become healthy new tissue, such as new neurons that could help regenerate damaged nerve tissue. Jiefeng Xi of Shanghai, China: Xi has been developing “optical biopsy” techniques. The goal is to assess the pathology of tissue located within the body at a resolution almost as sharp as that of a lab microscope. The long-term purpose is to enable doctors to detect disease at an earlier stage and more effectively treat the condition. The result should be an improvement in patient care and a reduction in healthcare costs. In connection with his research, Xi is listed as a co-inventor on three patent applications. His doctoral adviser is Xingde Li, a professor of biomedical engineering. Siebel Scholars and are chosen by the deans of their respective schools on the basis of outstanding academic achievement and demonstrated leadership. On average, Siebel Scholars rank in the top 5 percent of their class, many within the top 1 percent.